Medieval Times Toronto has an amazing promotion on now through April 5, 2015 where when you buy one general admission ticket you get the second FREE! My family absolutely loves going to Medieval Times for a special night out, we always have a blast! 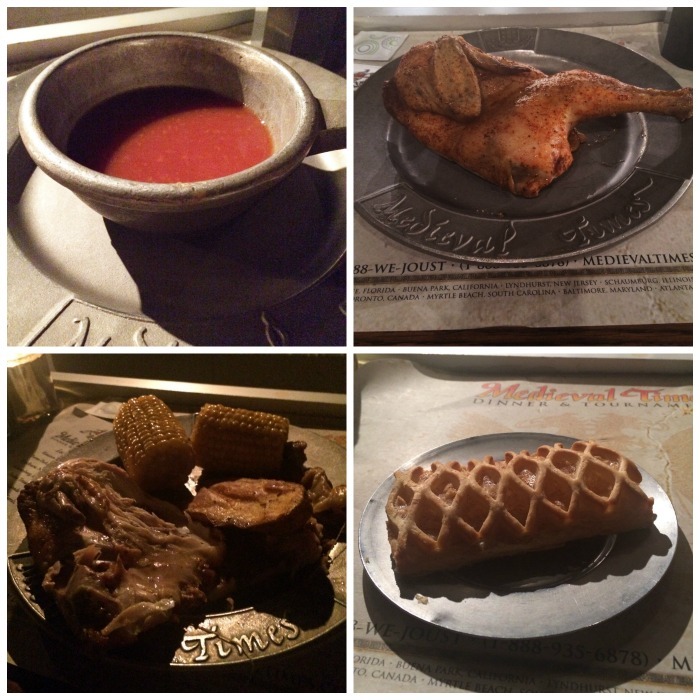 On February 28th we ventured to the castle to marvel in the excitement of the show and chow down on some amazing food! Although there were plenty of little ones at the show we opted to have my mom watch over Bella and just take the two older girls since we were going to the 7:30pm show and it would run into Bella’s bedtime! I think next time we visit we will book the earlier show to take Bella with us as I am sure she too would love the show. This was Hailee’s first time at the show as she was away on vacation during the summer when we took Abby and her friend. She loves animals and was in awe of the beautiful horses. 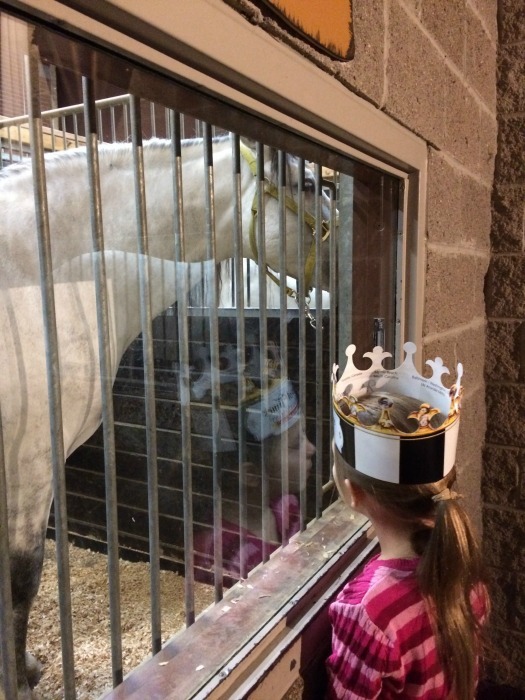 We like to arrive nice and early to look at the horses, watch the knighting ceremonies and shop for some souvenirs. The kids enjoyed some slushies and we took some selfies to remember our time at the show! Abby snapped a picture of Steve and I … which shows me just how badly I need that warm sun, man I am looking quite ghostly! Dinner at Medieval times is just amazing! The food is so delicious, I honestly could eat there every night. We were super excited for corn on the cob this time at the show! Normally my kids won’t eat meat without soaking it in ketchup, Abby even smuggled in packets of ketchup, but they both devoured their meals and Abby didn’t even bring out her stash! I would really like to know their recipe for that chicken and those potatoes because they are to die for. As many times as I visit Medieval Times Toronto, the show is just as exciting as my very first time. To watch all the children light up with excitement as the show plays out is the best. There were people of all ages at the show, from young to old, everyone was there to have a great time at the show. 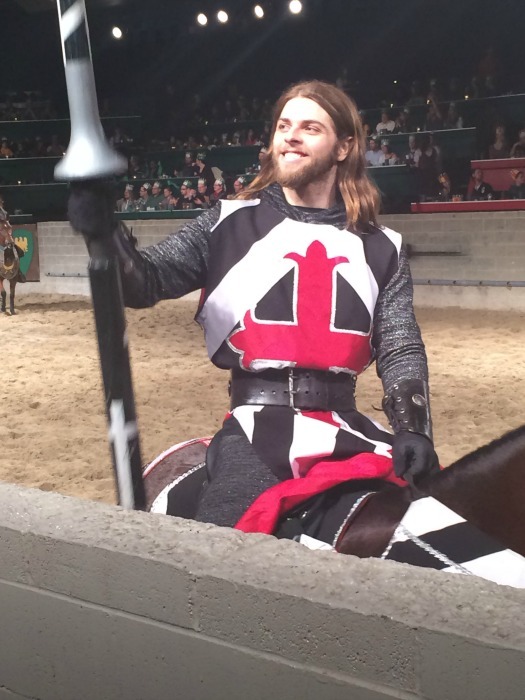 This time we were cheering for our black & white knight, how handsome is he eh ladies? I am a huge sucker for horses, aside from the heart pounding excitement of the battle, the horses steal my heart. They are beyond beautiful, graceful and the show they put on is amazing. It reminds me why I love horses so much and really need to get back out this spring, summer and fall to do some riding! 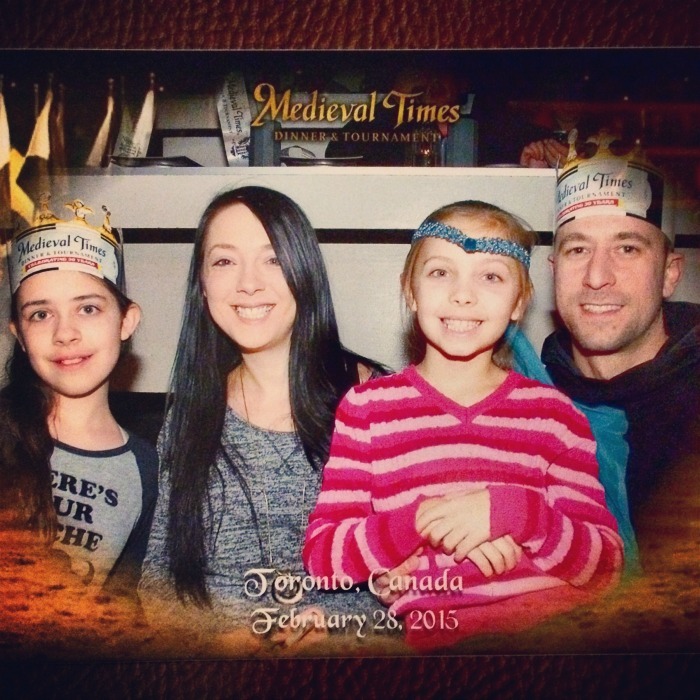 Medieval Times Toronto is an awesome family night out or even just a date night for two to get away from the kids, well, your own kids! There is a reason they have over 1,000 5 star reviews on their Facebook page, simply put it is an amazing time for the whole family! 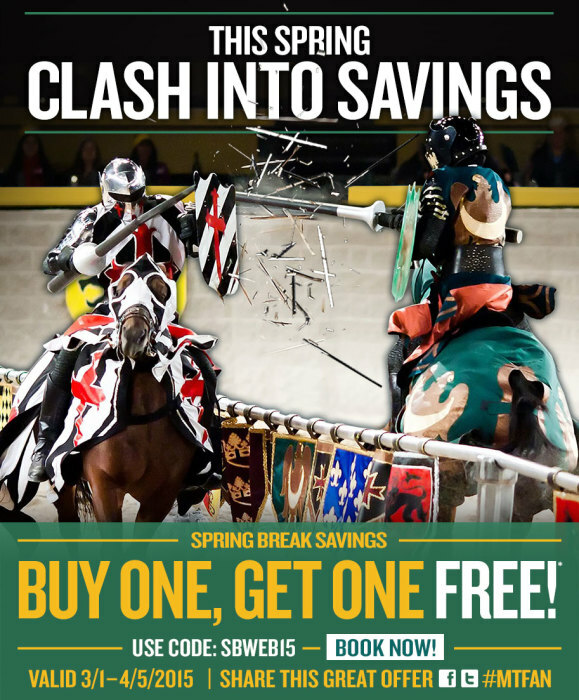 Medieval Times Toronto has an amazing Spring Break Savings offer that should not be overlooked! Tap into some serious savings and enjoy an amazing night of exciting battle with delicious food the whole family will enjoy. From March 1, 2015 until April 5, 2015 enjoy a special BUY ONE, GET ONE FREE offer on General Admission Tickets, a $69.95 value. Simply enter the discount code SBWEB15 after selecting your show date/time at checkout before selecting your ticket. Then pick which type of admission ticket you would like (1) and your (1) free ticket! This offer is also valid on premium seating with a small additional fee on the “free ticket”. Visit the Medieval Times Toronto website to book your visit today! 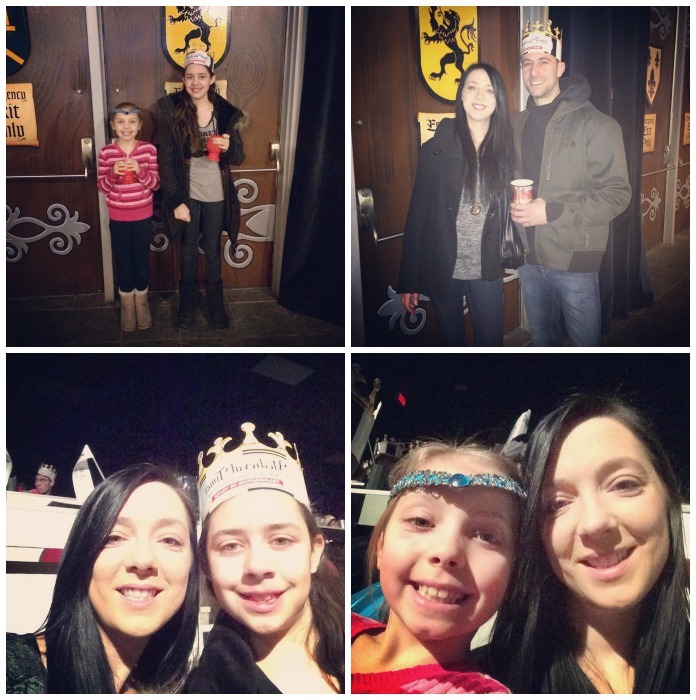 Medieval Times Toronto has generously given me 4 Kings Royalty Admission Tickets (Value $85.95 per ticket) to give away to one lucky Extreme Couponing Mom reader! Contest is open to those who are able to attend a show at Medieval Times Toronto. Please do not enter the giveaway if you are not able to attend a show in Toronto. Simply enter using the contest widget below. Disclosure: Although this post has been sponsored by Medieval Times Toronto, the opinions and language are all my own, and in no way do they reflect Medieval Times Toronto. Any product claim, statistic, quote or other representation about a product or service should be verified with the manufacturer, company, provider or party in question. « Garnier Ultra-Lift Miracle Sleeping Night Cream: Miracles Can Happen Overnight! I have been out of work for 6 months and would love to take my soon to be 10 year old there for his birthday. i’d love to take my kids as I’ve never been there. Looks like you had a blast! Love the review. I went a few years back (although I am deathly allergic to horses) it was a great experience. I’d love to take the kids now their a bit older. The knight actually looked at my youngest, age 2 at the time and threw her a rose. She was in awe! Abby got a rose from our knight when we were there in the summer she was pretty excited about that lol! My husband and I took our granddaughter back in December and she loved it. We would like to take our two grandsons too. The boys would love the horses. ive gone once before and I had a blast so id take my boyfriend and then two of my nieces because i think they’d LOVE to see it! ive gone once before and I had a blast so id take my boyfriend and then two of my nieces because i think they’d LOVE to see it!! I have always wanted to go to Medieval Times (I have never been before) and I have been looking into surprising my husband with tickets for his birthday in July. Every time I hear someone talk about it they say it’s a Great time and that I should find the time and money to go. We have never really been able to afford to go because the cost has been a little much for us. We have always struggled with making ends meet but he has always been positive through out it all and is my constant rock. So I hope I win to give my husband a birthday he’ll never forget!!! My husband and I would love to take our 5year old daughter and 8 year old son. Our son has been asking for the last couple years, this would make him a very happy boy to get this surprise. I would love to take my best friend. She has never been there before. I would love to win these tickets to be able to take my family and experience making memories that will last a lifetime. We have never been and by reading your review it seems like it would be an amazing adventure! Thanks for the great opportunity. New parents that have only been out once in the last 2 years for a date night. We’ve never been and would love to win and take our son and his nana with us. would love to take my niece and nephew to the show…it would be a great time. I would love to take my husband 2 sons. As the only girl in the house sometimes it’s hard to find an activity we all love but Medieval Times is a blast for ALL of us!! I love the food and the atmosphere. Ahhhhmazing chance! I would take a family member. Think it would be a good time for a girls night. I would love to win this to take all my nieces because I love being with them all the time. I’d love to take my family, would be great entertainment & food! I have never been and I live in Toronto, it would be so much fun, I love horses too!! I would take my hubby and daughter. I would love to take my daughters, they have never been, and the food looks great! If I was lucky enough to win I would take my husband and boys. I think we would all enjoy very much! my sister and I (and the rest of the family) want to bring my mother to midevil time for her upcoming 60th birthday. I’ve heard great things about the dinner and show. I would love to take my kids and husband. I think they’d love the show and I’d like to eat with my fingers and not have to do the dishes for just once. I would take my son, my hubs and my nephew, I know the boys woul dlove this and if I took them for the Jr Knight training they would just be unstoppable. My husband and I have always wanted to go to the dinner and show but have never had the opportunity. Now that we have two daughters, we would love to share this experience with them. It sounds fun! I would love to take my kids and husband and enjoy each others company. My kids are 8 & 11, they have never been. Would love to take them! Thanks for the chance. We would love the night out and we would use it as an excuse for a weekend away in the city! I would take my husband and kids along with me! Would take my hubby and my kids ! I’m sure my kids would be beyond amazed ! I would like to win because I’ve wanted to visit Medieval Times for so long. I’d take my whole family!!!!! I will be in Toronto April 3 – 8 for the first time ever…I am going with my boyfriend and this would be an amazing fun night! My daughter would like to go. I would love to surprise my BFF and her boys who have never been. Family night out for sure, haven’t been for a few years and my boys are chomping at the bit to go again ! I’d love to go because we always have a fun time and I’d take my family! I’d love to take my kids as they would be blown away by the show. I would love to win because I have several family members who love Medieval Times and I would bring family with me. I would love to win these tickets for a mom of 3 who has been trying to get the money to go for a few years now but hasn’t been able to. Would be great to give these to here and her 3 kiddos! My son would love Medieval Times! Thanks for the chance! It’s on my families wish list for 2015! would be a blast to take my family there. Haven’t been in forever. I would love to take my two young boys and my husband to the show. We have never been! Would love to take my husband and children but we are a one income family and can’t afford it. Looks amazing. I’ve always heard amazing things about Medieval Times but have never had the chance to go! My husband was laid off from work for 3 months this winter so winning thing would be a nice treat since we haven’t been able to do anything extra these last couple months! I would bring my husband & 2 children 3&4 ! Thank you for this opportunity! I would take my family with me which have never been here before! I would love to win this to take my family along for a great night out. We’ve had a rough start to the year, moved to new area, new schools, new friends to make for the kids and a major loss to our family, so it would be soooo good to kick back and just enjoy a special treat together!! I would like to take my nieces because one of them is currently studying medieval history in school. I would love to take my family, we have always wanted to go but to pay for 4 people is really expensive and we have never been able to afford it. Hope I win ! I haven’t been since I was in public school and have always wanted to take the kids, but never seems to be in our budget! What an excellent chance to win an amazing prize! Thank you! Would love to win as I have never been first off, and I absolutely love the entire Medieval era and all its glory. I would take my 2 boys and a guest of my oldest son. I love your review . We have never been to see a Medieval Times show. I think that my 4 year old would find it absolutely fascinating! Good luck all! Would love to go take my children and husband for my son’s birthday! We have never been!